Just a reminder for those of you trying to keep a pulse on the string of Fashion Weeks that are upon us, and the styles they bring into the spotlight, you can see all the runway shows from New York Fashion Week, London Fashion Week, and Milan Fashion Week on Style.com. So far in terms of jewelry, my pick for best trend, and I have WWD to back me up, is the statement necklaces made of pearls and flowers seen on the runway of Giorgio Armani. Anyone who was interested in my coverage of Fashion Week(s) a couple of months ago, knows how much I rely on the very important website Style.com for fashion news. If memory serves correctly, and I think it does, I have even referred to them as “the beacon of fashion reporting” at times. So imagine my shock when I saw this! Sorry, did I say shock I meant nausea! 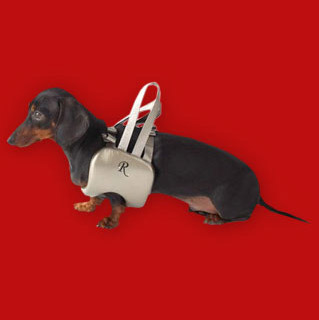 Just so there is no disputing the level of ridiculousness here, I want to be clear that we are all looking at a monogrammed life vest for a dog, that appeared on the must have items for the beach list on style.com. No offense dog lovers, but there has to be a line in the sand somewhere…! Plus in a dog eat dog world, any dog caught dead in a monogrammed life vest is going to get beat up on the playground, and have their lunch money stolen. photo from Style.com. Fred Flare Monogrammed Dog Life Vest. Available at www.horchow.com. ($89.00).